The secret behind a successful marriage has been discussed time and again, and everybody right from your friends to siblings to relatives seems to have an opinion on the topic. There have been endless discussions by marriage counsellors, celebrities and random people on how to lead a healthy and blissful married life. Even after all this fuss, we still hear about married couples getting separated or struck in divorce proceedings, every now and then. So is the concept of "happily ever after" in marriage just a myth propagated by romance writers and story-tellers? Of course, not! The concept of long and healthy marriage is not a myth. It is not even rocket science, as some people tend to believe. 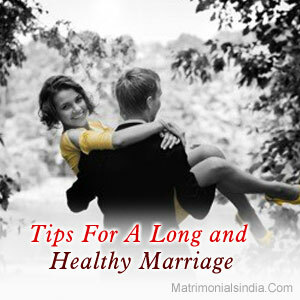 The tips are simple and if followed wholeheartedly will surely bear fruit in the form of a successful marriage. Communicate With Your Partner : This does not mean shouting out your problems or belittling your problems, rather learn to have a constructive discussion. Ask any expert and they will surely agree that there is nothing more important than communication between partners. Never Stop Appreciating Your Partner : One of the most important keys to a successful marriage is to respect your partner. If your partner has taken out time from her busy schedule to prepare n elaborate dinner for the family, be sure to thank her and tell her how much you appreciate her thoughtfulness. In case, your husband has taken the pains to clean the dishes in order to save you the trouble, be sure to let him know how much the sweet gesture means to you. Spend Quality Time With Each Other : Do not let anything stop you from spending a few hours of quality time everyday with your partner. Anything here could refer to a busy work schedule, children, household chores, etc. Spending time with each other is the first step towards building intimacy which is very important for a healthy marriage. Though these tips may seem too trivial to you to solve as grave an issue as broken marriages and dissatisfied partners, but they are quite relevant. By working on these tips, you can ensure that your marriage is happy and successful too.